Pahrump has a somewhat isolated location in a wide valley on the west side of the Spring Mountains, only an hour's drive from Las Vegas but very different in atmosphere and character. The town is quite dispersed; shops, restaurants and a small selection of lodging are spread out along six miles of the main road (Hwy 160), while the developed area extends for at least twice that, with many residences separated by vacant lots or larger patches of desert. The only other major route into town is Hwy 372, which soon crosses the California stateline and meets Hwy 127, from where the southern end of Death Valley is just 25 miles away. On the east side of Pahrump, several tracks penetrate a little way into the mountains, ending at trailheads for Mount Charleston and neighboring peaks. 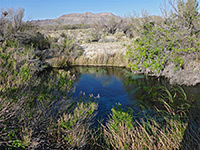 One other attraction nearby (22 miles) is Ash Meadows National Wildlife Refuge, a collection of lakes, springs and sinkholes. The second chain hotel in Pahrump opened late 2015; the 104 room/suite Holiday Inn Express is built just south of the main road junction in the city, Hwy 160 with Hwy 372 from Shoshone (California), within walking distance of restaurants, casinos and shops, including Smith's supermarket. Walmart and Albertson's are just a little further away to the north. The neighborhood though is quite lightly developed, allowing rooms to enjoy long distant views towards Mount Charleston and across Pahrump Valley. The hotel has a patio, fitness center, hot tub and outdoor pool, and it provides good quality free breakfast buffet. A 408 sq ft boardroom caters for small meetings or events. The Best Western is one of comparatively few hotels in Pahrump, NV, located along Highway 160, just south of the town center and within walking distance of shops, restaurants, casinos and other amenities. Landscaped gardens with large palm trees give the hotel a relaxed ambience, and some rooms enjoy far reaching views to distant mountains over the border in California. The Best Western has a large outdoor pool & hot tub, 24 hour front desk, breakfast bar, and some rooms with kitchenette facilities.